Nissan employees working at the company's Barcelona Technical Centre are proving there's more to motorsport than striving for the fastest lap times by taking part in a new concept in motorsport: ECOseries, which rewards efficiency and fuel economy rather than outright speed. The employees - who are all taking part in the series in their spare time - are using three Nissan Leaf in the zero-emission category. ECOseries, which is based in Spain and combines track and road-rally events over the season, attracts entries from a wide variety of road cars. Aside from the Nissan team, there are cars from rival manufacturers including Peugeot, Toyota, Volkswagen, Porsche and Mercedes-Benz. In the EV category, the Nissan LEAFs and a Mercedes A-Class E-Cell have been fighting for outright honours. 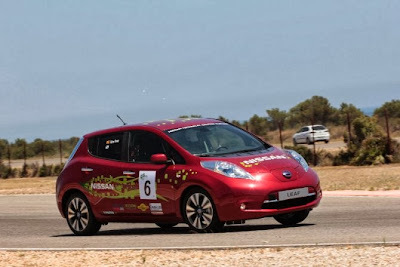 Although two of the team's three LEAFs are essentially standard, a third was introduced as a mobile test lab, running in the series' EV prototype category. For the final race, its battery pack was doubled in size to take battery performance to 48 kWh and allowing it to perform on more equal terms with the 36 kWh Mercedes. In the end, although the LEAF was quicker than the A-Class and ran at the same pace as the Nissan Juke with no potential range issues to affect the car's progress, the Mercedes took outright honours by lapping closer to its regularity target. A 48 kWh Leaf could have up to 250 miles (400 km) estimated range, although the extra weigh would reduce that slightly.